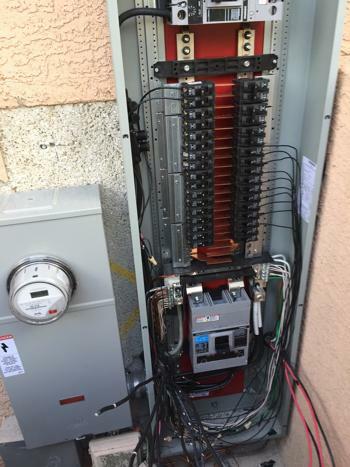 When you need an experienced, professional and reliable electrician in the Tucson area to provide electrical installations on new construction or remodels, electrical trim outs, electrical troubleshooting or panel change outs, Sunstate Power and Solar Solutions can take care of your needs for residential, commercial or industrial jobs. Being a fully trained, licensed, and bonded journeyman electrical contractor, as well as carrying a dual license for both commercial and residential electrical service, you can rest assured you'll get top quality service and we will be able to take care of your needs. As a local small business owned and operated by lifelong Tucson residents, our roots are here in the community and our reputation means everything. We take pride in each and every one of our projects we’ve worked on for over 20 years, big or small. We have worked on such a wide array of electrical jobs over the years, it’s impossible to list all we can do here on one page. A few of the more common electrical services we perform are listed below, but if there's something you need that you don't see here, don't hesitate to give us a call. More than likely, we can help you with whatever you need done. Building Trim Outs Including New Plugs, Switches, Light Fixtures, Ceiling Fan Installs etc. Below you’ll find some Frequently Asked Questions (FAQs) and our best efforts to help clarify things for you. But if you have any questions you don’t see here, please call us. We love to help our Tucson neighbors! Journeyman Electrician - What Does That Mean? Brent Young, one of the 2 co-owners of Sunstate Power and Solar Solutions is a journeyman electrician. This means he has been through a 4 year apprenticeship program during his time with Wilson Electri﻿c and now has a certificate from the State of Arizona and the US Department of Labor certifying that he has attained a certain level of skill and knowledge as an electrician, allowing customers to have the utmost confidence in his abilities. After 5 years with Wilson Electric, Brent went to TLC Communications and became their electrical manager. This is where he honed his skills in project management, estimating and more. He ran the electrical side of things there for years, including everything involving DC power, such as cellular towers and data-com centers in large central offices for companies like Cox and Comcast's power work. This is where he got low voltage and cabling and fiber experience, working there for 5+ years doing electrical project management, datacom cabling, installs, rough-ins, fiber installs and hookups. He also worked for Flowing Wells School District as a district electrician as well as AKC Electric, and CPT (Constant Power Technologies) - specializing in DC power, constant power, backup power and cell phone towers. Brent is also licensed, bonded and insured with the ROC (Registrar of Contractors in Arizona) as a licensed electrical contractor. Brent’s brother, Trevor Young, is a licensed, bonded and insured HVAC contractor. They both carry dual licenses, meaning both residential and commercial work is covered. Do I need a Licensed Electrician to work on my home or business? As a consumer, having any kind of work done by a person or business who is NOT licensed and insured is taking a huge, unnecessary risk. Any problems or injuries that may occur during the course of work is putting you and your home at risk of being held liable. And if anything bad were to happen after the work is completed, such as a house fire caused by an electrical short, you would have no recourse with the person who did the shoddy work. When someone says they’re unlicensed by choice, it should definitely give you reason to question whether they’re right for the job. Sure, they might charge you a little bit less because they’re not needing to cover the expenses associated with being licensed, but truly, it’s not very much money. There is a lot more security that comes with a licensed contractor. In addition to the insurance coverage mentioned earlier, there is also the fact that to be licensed, the ROC will do their due diligence on you, making sure you have all the experience you say you do and it includes a criminal background check too. All in all, it provides for a lot of peace of mind regarding the person or company you’ll be hiring. Who would need a Panel Change Out or Service Upgrade? A lot of older homes here in Tucson, Arizona have the old, Federal Pacific electrical panels, which have been deemed a fire hazard. 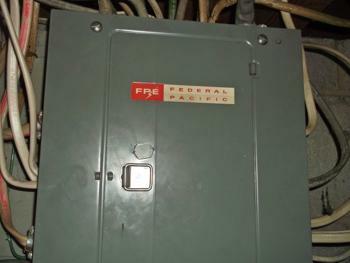 So if you happen to have an older home and you look at your electrical panel and see “FP” or “Federal Pacific” on it, it’s really best to just have it changed out before you run into any serious problems, such as a house fire. The issue with these old boxes is that the breakers themselves are now so old and crunchy that if there is an electrical short in the house, rather than the breaker getting tripped, it’ll just stay on. When that happens, whatever is shorting out will just continue to short, getting hotter and hotter, melting and potentially leading to a fire. BINSR is a term used in real estate meaning, “Buyer Inspection Notice & Seller Response”. It’s work that a home seller needs to have done in order for a buyer to agree to a purchase. We work with a number or real estate companies, doing a lot of repairs for real estate agents around Tucson. When they have a house that needs electrical work completed in order for a successful transaction to complete, they know to call Sunstate. We also work on new construction and remodels, including property investors and house flippers. Sunstate is a very versatile company. No matter what you need, from air conditioning, electrical, solar or low voltage work, we can not only do it, we can do it very well and at a very competitive rate. We always provide quality work to assure the long term safety of everything we work on. Coronado National Forest - A few years ago when there was a big fire in out there, we went and set up all the power and generators to all the trailers and buildings to have an operational mission control center to battle the fire. This is the kind or work where you need to get it done quickly and get it done right the first time. There’s no room for mistakes, and they chose to call Sunstate. Chiricahua National Forest for the U.S. Forest Service in conjunction with High Noon Construction- They needed service on their air conditioning, electrical and datacom. Sunstate was able to take care of it all for them. We took a gutted building and brought in power to the cubicles, low voltage cabling for the computer systems, lighting and ceiling fans and added air conditioning throughout. We quickly and efficiently turned it into an operational office for them.